A culturally complex and diverse country, with gorgeous waterfronts, wild safaris and stunning landscapes. Cruise the V&A Waterfront, South Africa’s most visited destination and where the land meets the sea. Dine in restaurants and cafes with a myriad of regional delicacies, artisanal breads and cheeses and of course, biltong. Sip a tasty craft beer as you take in the beautiful views of the harbour, and go wine tasting at Victoria Wharf - the widest selection of wine in the world! Take the cable car up Table Mountain, a massive plateau overlooking the city, and enjoy a cocktail as you watch the sunset at the mountain top bar. 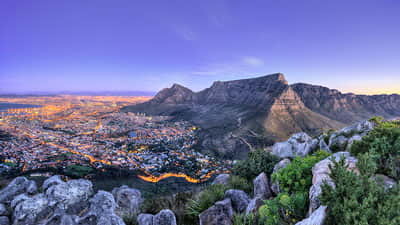 Or hike up Lion’s Head, Table Mountain’s little sister. Go sightseeing at Cape Point, the southernmost point of Africa, or head out to Robben island where Nelson Mandela was imprisoned. South Africa is a year round destination, with the best weather between November and February. For whale watching, visit between July and November.